The Surge was one of 2017’s surprise successes, rising above the glut of Souls-likes on the market thanks to its unique sci-fi setting and challenging (even by Souls standards) combat. Development of The Surge 2 is already well underway at Deck13 Interactive, and Wccftech got a chance to check out a live gameplay demo of the new title behind closed doors at E3 2018. The first thing that stood out about the demo was the lack of grungy industrial environments that dominated the original game. 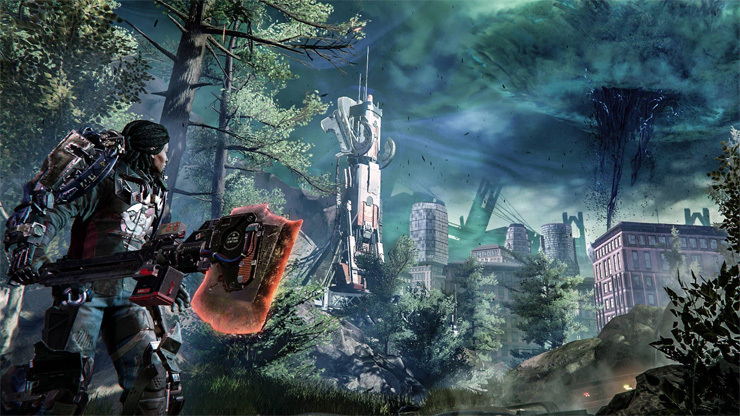 The Surge 2 takes place in Jericho City, an immaculate futuristic urban environment, filled with a surprising amount of greenery and plant life. According to Deck13, all the vegetation in the world is actually artificial – a creation of the privileged upper classes of Jericho City – but it certainly looks real, and is a welcome change from the first game’s grit, grime, and rusted metal. The demo took place mostly within the confines of a lush city park, where a particularly dangerous creature has set up shop. By activating a series of repellers, the player can drive the wily beast to the center of the park, where it can be taken out, but, of course, a number of unfriendly mercenaries stand in your way. 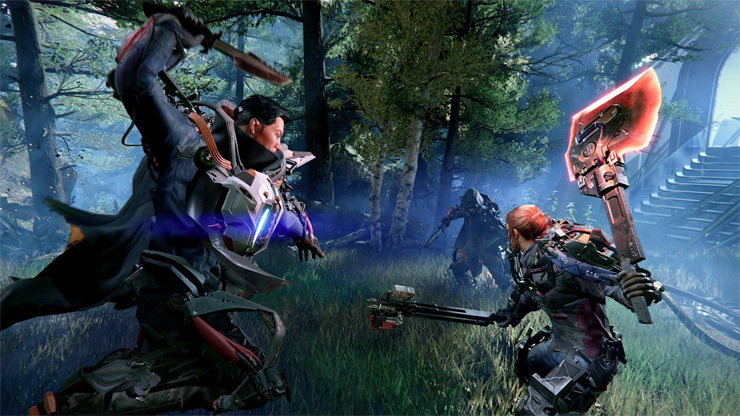 Much like the first game, The Surge 2 lets you target specific areas of enemies during combat, but now parts may have special modifications – a special weapon, a cloaking field generator, ect. Deciding what part to attack first now comes with an extra layer of strategy. Upgrading your character, which you can fully customize via the game’s new character creator, is now more straightforward and versatile. It seems players can now more quickly and directly equip the gear and weapons salvaged from severed limbs. No need to farm crafting materials. Ranged weapons can also be attached to a drone which will help you out in battle. Deck13 is promising a much wider range of gear and a number of new weapon classes, as they want players to be able to assemble their own “bag of tricks” to tackle enemies their own way. The demo culminated in a battle with a boss, which initially appears to be a harmless statue, before transforming into a menacing ‘bot. Deck13 emphasized that you’ll be able to tackle bosses how you’d like, creating your own weak points. 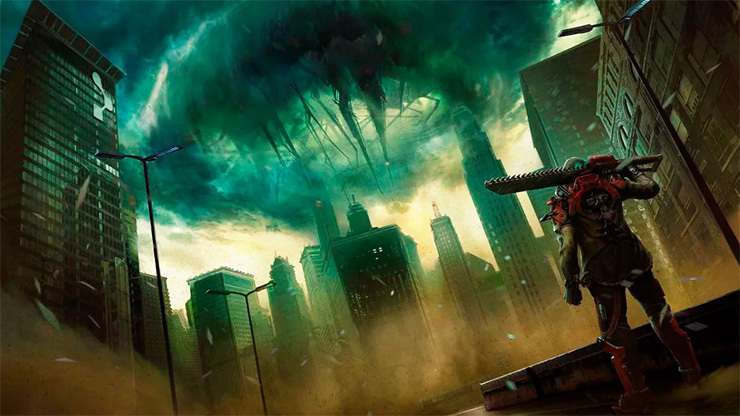 Generally speaking, The Surge 2’s combat looked notably smoother and quicker than in the first game, with the boss showdown being a particularly good demonstration of the improvements. To start, could you give us a quick overview of The Surge 2’s story? When does it take place in relation to the first game? The Surge 2 takes place a couple months after the first game, so we’re continuing the story. Of course, we’re no longer in this industrial setting of CREO Industries, but in Jericho City, where we’ll witness a lot of the effects of the mysterious power surge we witnessed in part one. As you can create your own character at the beginning of the game, there are different ways the story will evolve, depending on what character you pick. So, there’s not just one character anymore, we’re not playing as Warren, and we’ll encounter lots of characters that play a strong role in the story this time, and we can decide how to deal with them and how much we want to get involved in their stories. It sounds like the story may have branching paths – what kind of choices will the player encounter? In general you’ll follow one trail, but there’s lots more choice in what you want to focus on. Things you might want to leave out or dig into more. You can choose how you reach the end of the game. It’s not like we have totally different endings, but they will change depending on your actions, and there’s a lot of points where can make decisions. Not only in terms of quests or sidequests but also which enemies and areas you want to tackle first. So, there’s a lot of room for you to shape the story this time. 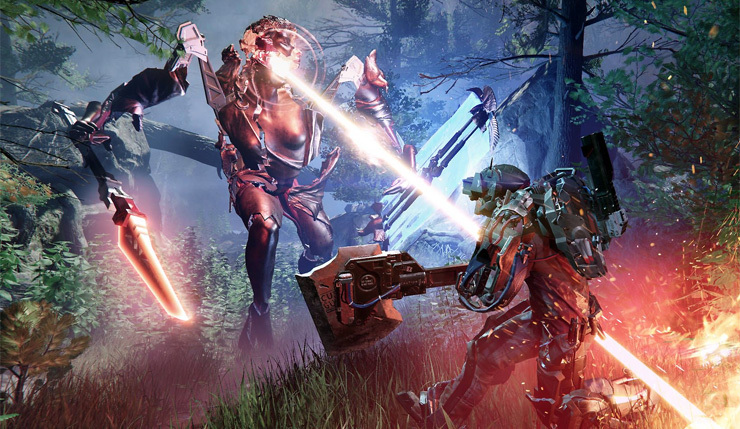 The Surge 2 looks a lot more open than its predecessor. What’s the scope of Jericho City? Would you consider it a full open world? We wouldn’t consider it a completely open world, but it’s much more open than the first game. It’s also much more interconnected than the first game. Having this urban environment forces you to traverse the areas much more. It’s not a linear experience where you go from level to level, and maybe there’s some backtracking — you can really decide where to go and some levels naturally lead you back into other levels you’ve visited before. You have hubs where you can meet characters that you’ll revisit often. It’s a living environment and it makes sense for you explore, to find new stuff, to use new items you couldn’t use before. We also have a lot more verticality — you can play at street level, high up in buildings, and underground, and they’re all connected with one another, so you can quickly travel between locations. The first Surge game was criticized for being a bit monotone visually – lots of industrial environments. The sequel is a lot more varied, greener. Were you intentionally responding the criticism? It’s always good to go green, right? Good for the environment! We wanted to create an industrial atmosphere in the first game, but, of course, that’s somewhat limited, so staying there wasn’t really an option. So, we said, ‘Where can we go to provide a very new and interesting experience?’ and it was a very deliberate decision to show more variety. Having an urban environment allows us to do that. How do the new more organic environments affect gameplay? Can they be used to the player’s advantage? Yeah, as you could see with the Hunter enemies while using stealth you could track their movement by just looking at how the grass moves. This is stuff we like very much, so, the new tech we have for the game, we don’t want to just use it for visuals, we want to use it for gameplay. So, [the natural environments] can be used to your advantage or the enemy’s advantage. During the demo, you mentioned enemies can now communicate and team up on you. What are some other ways enemy AI has improved? The enemies are much more clever and agile. They’ll chase you and won’t be blocked by the level geometry. They can overcome obstacles, and use stuff like ladders and elevators. And, as mentioned, they can also communicate with one another, so everything will feel more alive. Not only for the enemies, but also for the player, who also has new options for traversing the game world. Man, the first game was challenging enough! Will players have new abilities to help them combat these smarter enemies? There’s a new blocking system that lets you block from different directions. So, if there’s an attack coming from the right, you’ll do a right block and recoil the attack. You need to pay close attention to the moves of the enemies. Our combo mechanics are greatly enhanced this time — they’re much more precise and give you more control of your character. For example, in the past you’d string together a combo and after the fourth or fifth hit, you want to break, but you can’t because the character is still doing the combo animation — that’s no longer the case. You can always move the character as you want, which makes your character feel more agile. Combat is a bit quicker in general, depending on what kind of weapon you use. Speaking of weapons, how many new ones can we expect in the game? We increased the number of weapon classes from 5 to 10, there’s lots more variety. There’s also more opportunity to say, ‘This is my type of weapon’ and become really good at that weapon. You’re not forced to use [a weapon] because the game requires it to overcome an obstacle. I also have to ask about dismemberment, as its one of the Surge series’ trademarks. How have you updated the mechanic? Dismemberment was, of course, something we knew we had to focus on. We’ve improved visual feedback, so you’re better able to choose what to target. There are more tactical options, as some parts have special tech items attached. You can also choose if you want to destroy a tech item, of if you want to not go for it, so you can salvage it for yourself later, so there’s a risk-reward. With character creation now being a part of the game, will there be any cosmetic gear? You can create the look of your character, so hair, skin color, gender, whatever. There’s also a layer of clothing you can change. In the first one, Warren was running around in blue overalls for most of the time, but now you can change what you’re wearing in-game. Of course, there’s some special nice loot hidden in the game that gives you some really unique, outstanding, and crazy items you can wear to change the look of your character. Will the game have microtransactions? Will you be selling gear for real money? Nothing like that is planned. There are vendors in the game, but they’re for classic RPG buying and selling mechanics. You can’t buy things with real money. Will The Surge 2 be enhanced for PS4 Pro and Xbox One X? Yes, absolutely. There will be special features for those platforms. I can’t say exactly what those features will be, but we’re looking into that. Are you aiming to support 4K? 60fps? We probably won’t support both at once but will have different modes for performance and framerate. This game is so much about timing, so we need to have an awesome framerate, especially if you have the faster machines. On the other hand, we also want the game to look good. So, there’s a lot of balancing we need to do, and probably some will be done in the final tweaking stages before the game is released. We’ll see how much power we can get out those consoles. Great, I appreciate you taking the time! The Surge 2 stomps onto PC, Xbox One, and PS4 sometime in 2019.